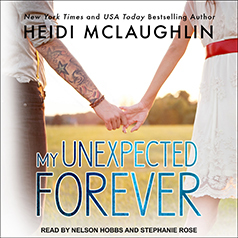 New York Times bestselling author Heidi McLaughlin presents the second novel in her Beaumont series. I expected a life of music. I expected to raise my son. It took one look to make everything change. I never expected happiness. I never expected to find her. I never expected to feel desire. I never expected I'd be a family man. I never expected to be loved. I never expected to fall in love. They say you should expect the unexpected, but I didn't realize my unexpected would be the forever kind.